Saturday night, 1980 something when listening to a LP was still a fond leisure activity. Early in the night the question would arise "which side" which was short for Simon and Garfunkel: The Concert In Central Park - in other words what perfect album side did we want to hear first. All four had compelling moments along with catchy sing-alongs such as "Mrs. Robinson" (Side One) or "Fifty Ways To Leave Your Lover" (Side 4). We often listened to that legendary live platter from start to finish. The music of Simon and Garfunkel was written during the turbulent 1960's yet the songs were timeless speaking to us who were second generation devotees of the duo who achieved amazing success before going their separate ways in the 1970's. Perhaps it was no surprise that we saw fans of all ages in attendance at The Simon & Garfunkel Story at the James K Polk Theater (TPAC) in Nashville, Tennessee on November 01, 2018. Now seen by over a 1/4 million people across the globe, The Simon and Garfunkel Story is a critically acclaimed concert style show that tells the tale of 2 childhood friends who become one of the world's most celebrated music duos of all time. Utilizing state of the art video projection, incredible lighting and a full live band The Simon & Garfunkel Story was an engaging performance featuring deep cuts along with the hits such as "April Come She Will", "Homeward Bound', "Kathy's Song", "Scarborough Fair" and more. Large projection photos along with original film footage also enhanced this polished production. On the screen above the stage the accomplishments of Paul and Art were listed as two actors who looked and sounded like the originals strolled out to play the surreal "Sounds Of Silence". "He Was My Brother" was backed by film clips of the Civil Rights movement. The pair greeted us before telling the tale of the kids from Queens, NY who bonded over their love of the Everly Brothers. The youngsters calling themselves Tom and Jerry were inspired to write "Hey, School Girl" which did not take off. A few years later they were stars using their own names. Between more classics the story of Simon & Garfunkel unfolded. Paul had gone to England to be a part of the music scene there. Art stayed in the States to attend college. Paul wrote albums worth of material that he felt needed another voice, so the two converged to record the tracks Simon had penned thus paving their path to success. The singers in Nashville were successful in their retelling of the music and the duo's muse. Supported by a talented band in matching suits, Paul and Art enchanted us with their songs and stories as the footage flowing above their heads reminded us of the history that molded the music. Other highlights of the concert were "A Hazy Shade of Winter" a moving "Old Friends" countered by the peppy and whimsical "Punky's Dilemma'. The encore featured a beautiful "Bridge Over Troubled Waters" and "The Boxer" with punchy lighting. This immersive concert chronicled the folk-rock duo's career culminating with the Concert in Central Park in 1981. It was a historic moment in music history but also an important one for New York City. At that time, Central Park had fallen into disrepair. The Central Park Conservancy was formed to renovate the park but funds were required. The reunion concert on September 19, 1981 raised money for this important cause. Interestingly, Yoko Ono the widow of John Lennon was also an advocate for the park. Her generous donation led to the formation of Strawberry Fields where the Imagine mosaic resides to honor the formal Beatle. In the 80's, artists had a major impact on Central Park which today is a green oasis and part of Paul and Art's legacy. Plus, they got a great album out of the deal. 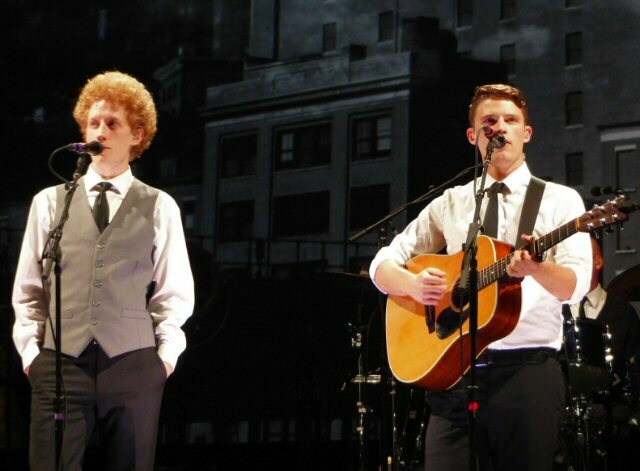 The Simon and Garfunkel Story was a terrific tribute to the lives and music of Simon and Garfunkel. On tour in the UK, US and beyond for 2018 and 2019 the show features different lead actors and bands but the footage, lighting, music and visuals are a constant that will continue to speak to generations of music fans.